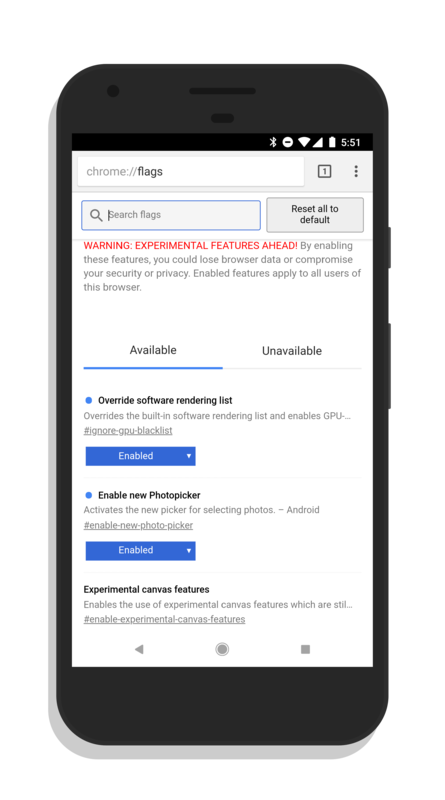 Chrome 64, the next major release of the Chrome browser for Android and other devices, is currently in beta and likely will be for another month or so. But that doesn’t mean that we don’t get a glimpse at what will be in the release. When it comes to the Android build at least, we can expect to see a much improved Flags page. For those who aren’t familiar, flags allow you to change granular elements of how Chrome functions on your phone. You get to this page by typing chrome://flags in the omnibar and you can enable or disable specific features. Be warned however that they are experimental in many cases and can cause instability. In Chrome 63, the Flags page got a bit of a makeover that made it much easier to read. In 64, Google is going a step further. In Chrome 64, when you change a flag, that setting is moved to the top of the Flags page for you to easily find. No more having to scroll through the extensive list of flags to find that one you changed way down at the bottom of the list as you have had to do in Chrome since time immemorial. If you are one who likes to tweak flags in Chrome, this new build will make your life a bit easier. There is no official word on when Chrome 64 will hit the stable channel but it will likely be in February or March. There is a slim chance it could sneak in this month but given that Chrome 63 is still rolling out to Chrome OS devices, it is unlikely.